from Nestorgames, made in Spain. 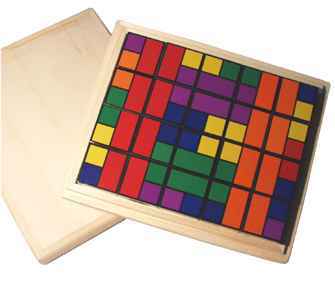 ...by Frank Nichols, made by ThinkFun, Inc.
An offshoot of MacMahon's squares, the 64 different 2" tiles of IZZI are almost a complete set of all the combinations of a square cut into 8 black and white triangles. The full set would be 70 tiles, so the 6 most regular tiles are omitted to get down to 64. Just match them exactly, black to black and white to white, on the sturdy die-cut cardboard squares. There are zillions of solutions, and you can see some gorgeous ones on Jaap's Puzzle Page. It's fun and a never-ending challenge for ages 8 to adult. Our supply is sold out, but you can get it directly from ThinkFun and from Amazon. 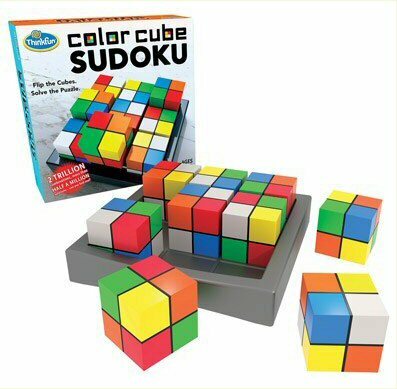 IZZI is a trademark of ThinkFun, Inc.
IZZI-2 is a trademark of ThinkFun, Inc.
Color Cube Sudoku is a trademark of ThinkFun, Inc.
Add to your order Color Up is a trademark of AVAX Corp.